Yesterday my heart broke into thousand pieces. I need this recap for my own sake. I prayed constantly from the second of the first beta results to the time I arrived at the lab for the second beta. The two days leading to the second beta, I told Clay and Eli that I loved them and that I really wanted to see them and hold them in my arms. I woke up very early in the morning, couldn’t go back to sleep, and visualized a black curly haired little baby crying so hard because somebody woke her up. I had great distraction in the morning from my morning appointments. Nervousness consumed me from noon on. I imagined two different versions of report from Dr. E: Yay Isabelle the beta more than doubled, or I’m so sorry that this is not what we had hoped for. I wavered between the two. I had a whole village of ladies (and gents) waiting anxiously with us for the results. We were on Facebook and they were there waiting with me. Many of them couldn’t focus on work or whatever they were doing. They were all rooting for us and anticipating great results. Dr. E didn’t call until 12:48. From her voice, I knew. She said, the results are not what we had hoped for (exactly how I envisioned the conversation would go). The beta level only went up two units. We would want to see it double at this point. She said that I had a choice of stopping all the meds at that point and just let my period come. Some people choose to continue the meds until Friday, or Monday, or whatever time frame just to see. She said that either way, she’d support me 100%. At that point, I started bawling. I said that I would want to stop the meds if the pregnancy is not viable. I asked her why is it so tough? Of course there is not an answer to that question. She said that my period should come in a week. Then we’ll talk again. She said, I’m so sorry…. I called Bob and couldn’t even talk. That kind of cry that I was doing…. I don’t remember myself crying like that in my life. Like what Elisha said…. that it feels like your gut has been punched and the wind has been knocked out of you. That was exactly how it felt. Poor Bob, he wasn’t feeling any better but he couldn’t come home early because he had a presentation to do at 4:45. I was howling so loudly in my office that I am sure someone must have heard my cry even with my closed door. I just couldn’t stay there at work, but I also couldn’t call the front desk staff to ask them to cancel the appointment. I didn’t think I was going to be coherent. So I went to my next door colleague’s office. She is in the know… but I hadn’t shared with her about the first beta results. She listened to me, hugged me, rubbed my back, called the front desk, kissed my head and told me to go home. I’m grateful for my job that I could just take off like that. I was crying from my office to the elevator to the parking garage to the car all the way to Ocean Beach. I didn’t want to go home because I didn’t want to see my mom yet. I know my mom so well that she would tell me NOT to cry. The last thing I wanted someone to do is for them to tell me NOT to grieve and mourn the way I needed to. I drove straight to Ocean Beach. At first I sat in the car and continued howling. Later I dragged one of the beach chairs we had in the trunk and went to the beach itself. I sat there crying and being crazy and was all by myself in front of the water. The sky was so bright and the water was so beautiful. It was the saddest place on earth at that moment. That was the perfect place to be for a moment like that. I sat there for two hours. I texted my sister-in-law and knew that I could go over to her place later when she got home. At one point, the wind had picked up and it was very cold. I had to go back to the car to get my jacket and a blanket. Then I sat there in the beach chair for some more until I finally felt hungry. 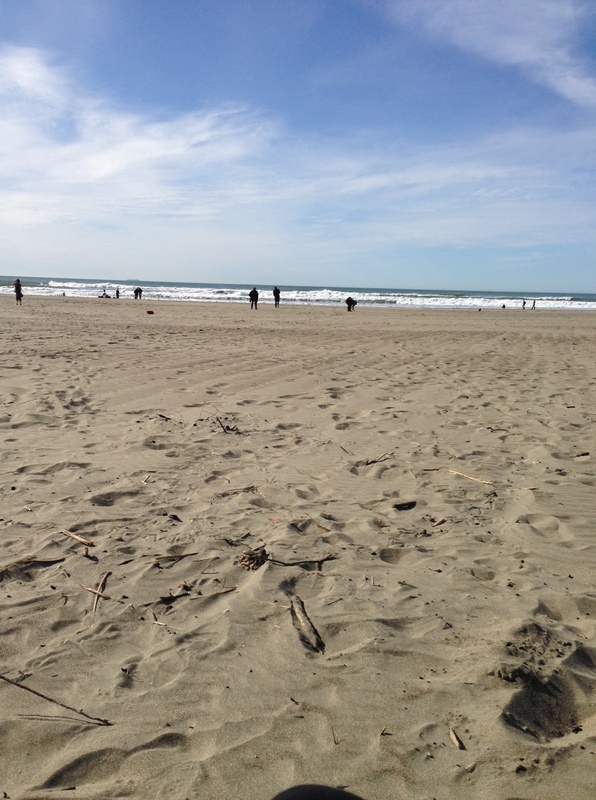 I could not get the stupid beach chair to fold again… Imagine me with tears streaming down my cheeks, I dragged the blanket, the water, the purse, and the unfolded beach chair in the sand back to the parking lot. What a sight…. In the parking lot, a dad was putting a helmet on his little girl before he rode away in his bike… Tears streaming down my face again. I went to a nearby cafe to get a cup of caramel latte (the first coffee in a few weeks) and a sandwich. While sitting at the entrance eating, a dad walked in with a toddler. Then the mom walked in, with a big belly. Didn’t want to see them. My SIL texted me at that moment. Perfect timing. I arrived at SIL’s house. Again bawling….. She listened to me, teared up with me, then prayed over me. I had a pounding headache from all the crying. She had me lie down on her bed, placed a blanket over me, and tucked me in. Then she sat behind me and rubbed my back for a good half an hour while I took a nap. That was the best comfort I could ever imagine when my husband was stuck at work. It was so sweet to have her around, loving me, and just being there with me quietly while I was resting, trying to heal, and just being in the moment. When I woke up from the nap, the headache was gone. It was 6:40 and I knew that Bob was trying to rush home. I checked my phone and saw all the comments from you ladies. Your loving kindness really helped make the situation better. Bob was trying to call me at 5:50. So I packed up, gave my SIL a tight hug, and drove home. Of course I had to cry again when I saw my mother. I explained to her what had happened. She teared up, hugged me, and told me not to cry. I knew that it was a wise decision to go somewhere other than home… I really didn’t need her to tell me anything. They go with my “Hope” pendant. 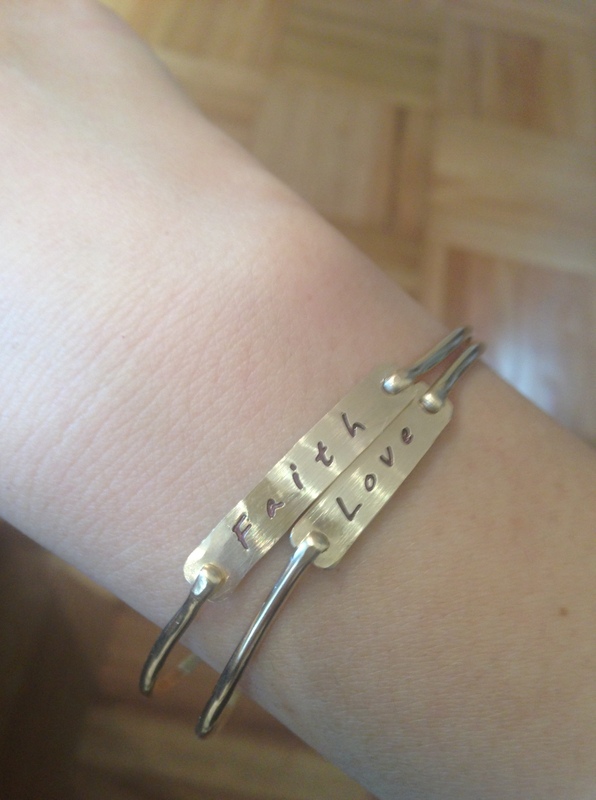 Very fitting as I need faith, hope, and love at this moment. Bob came home with a smile on his face and a big giant hug. It was so nice to have him by my side. He managed to make me laugh a few times yesterday. We went out for dinner. He said that the most important thing right now is our marriage. We will have our baby. That’s his faith. I am very thankful that despite all the things that happened yesterday, I still had a good night sleep. I woke up this morning with peace in my heart. I teared up a few times but in general I am doing well. I thought about what my friend M said yesterday in her comment. I take back whatever I said yesterday that “I would rather not get pregnant than to have it taken away from me”. This is my path. I treasured those embryos and dearly loved them and still do. They are our first children. They fought hard for life. Although they didn’t make it to this world, I was grateful that they were inside me and tried hard. I am also glad that I did POAS and got my two lines. “The embryo has likely detached and is no longer in existence. Imagine a drop of water in the sun. It evaporates in a way. Today I fly to San Diego for a Bible conference for three days. So I won’t be back until Sunday. This is a welcome distraction as well as a chance to focus on God and the Bible. I love all of you and thank you for being there for me at this time of heart break, grief, and healing. I will see you all when I come back on Sunday. I am so thankful for all of you who celebrated with us yesterday! Thanks for being there. It still has not quite sunk in that my name and the word “pregnant” are associated with each other. I was in a daze all day yesterday… Just couldn’t believe that it was really happening. Everything took extra long to do; cooking, cleaning, writing notes at work, etc. Just getting the news made me a little… in shock. I went for a last minute acupuncture appointment. Last week after my appointment, I was telling the receptionist that I wouldn’t schedule for an appointment this week. I was taking a break. Really, deep down, I didn’t believe that the beta would be positive. So once I found out about it, I immediately emailed my acupuncturist and she squeezed me in. She said she could help my body accept the embryo more. I’m so grateful that I have such a great relationship with her that she took me in right away. Throughout the night, I had a headache that lasted from about 7pm to this afternoon. Almost 24 hours. My go-to magic pill is usually Excedrin. Then I realized immediately that it wasn’t safe to take Excedrin during a pregnancy. I emailed my RE to confirm. I fought the headache for a few hours then finally decided to pop two Tylenol. It really didn’t help much. So I had a headache on and off all night long. I was also exhausted after I made dinner last night. It was priceless to see Bob’s face when he came home. That big grin on his face just melted my heart. 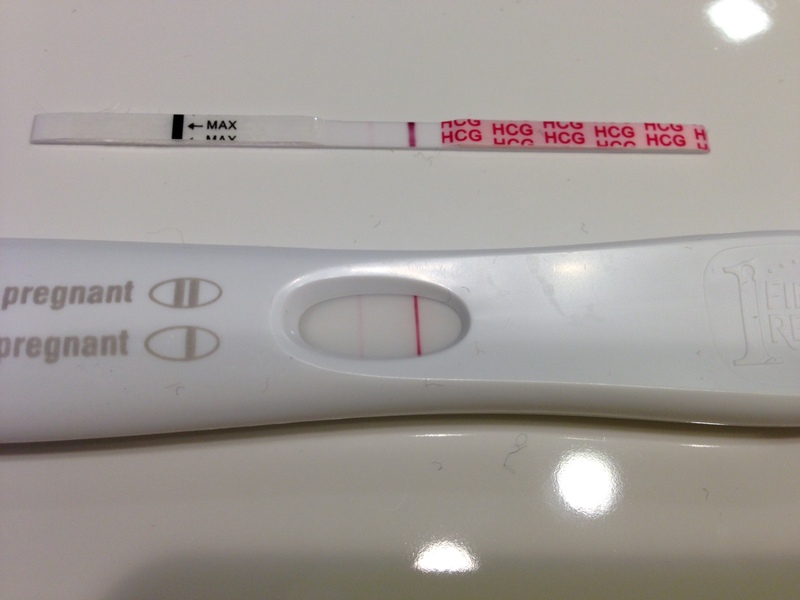 My first ever BFP in my life. That box of FRER must have been lucky. Two pink lines for both sticks. Bob came home. I showed him the sticks. He was grinning from ear to ear. After all, he wasn’t mad at me for testing since the second line came up. But he really doesn’t want to test again. Comparing the darkness of the lines will just drive me crazy and stress me out. I agree with him. So after tomorrow’s beta, I will most likely just use the CB digital so I can see the word “pregnant”. Then I’ll put everything away. Second beta is tomorrow at 7:45am. I have been feeling quite calm all day today. At times it freaks me out a little when I feel the discharge from using the Endometrin and think that I must be spotting or bleeding. It really helps to read this post by Elisha. One day at a time. Today I want to believe that this will be okay in the end. I think that this baby, whoever it is inside me, deserves to be loved and cared for from day one. “Hey babe, the pregnancy line cannot be caused due to progesterone right?” Poor babe, he was worried that it was a false positive. No babe. No amount of progesterone can create a second line for you! That was what my RE asked me when she called at 12:17pm. I was like.. What? Are you sure? What’s the number? So the number is 21. I know in my head it’s a bit low. But it is 8 days past 5 day transfer. She said anything over 15 is considered pregnant to her. The number has to double on Thursday to 42. I know too much about beta….. I need to chill and praise the Lord and be joyful for the first hurdle to be over. Now bracing for the second beta. Please keep us in your prayers and thoughts for Eli or Clay to stick with us please. What a great morning we had. I woke up and pushed Bob out of bed so that he could go to fitness bootcamp. I got the license to be lazy and to lie in bed before the transfer. When he was gone, I continued to lie in bed and started to pray to the Lord about our embryos. I prayed that Eli would’ve turned into at least a morula if not a blastocyst. I prayed that Clay would thaw very well. Then I began to visualize my uterus to be a very welcoming, warm place for those embryos to burrow into snuggly. Then I fell asleep again. Before Bob left, he reminded me to remember to fill my bladder. I totally forgot that I needed to do that! This cycle has been interesting because I kept on forgetting things. I almost forgot that we needed to do injections two times! And now the bladder thing. I don’t know. My head just wasn’t there. What a big relief! I would take a morula any day over an embryo that stops growing. The similarity between Clay and Eli is eerie. Clay became a morula on day 4 and was still a morula on day 5. Here is Eli, a “very pretty” morula on day 5. I am thrilled that they have the same progression, which means that Eli might just become another blastocyst if we decided to let it grow until tomorrow, day 6. That email brought a little tear to my eyes. No matter the outcome of this cycle, it’s so overwhelmingly emotional to get to this point for a person with diminished ovarian reserve to finally make one or two embryos and to be able to transfer them for a fighting chance of pregnancy and a take home baby. My heart was filled with gratitude. Then cued the next step: drinking lots of water. Started at 10am, I downed at least 3 to 4 eight-oz glasses of water. I was feeling fine until about 11am. Five days ago, I was dying for a glass of water but was prohibited from having one. Today, I was ordered to drink lots of water but not to pee. The irony of life. On the way there, all sorts of thoughts came to my head. What if we get a flat tire? 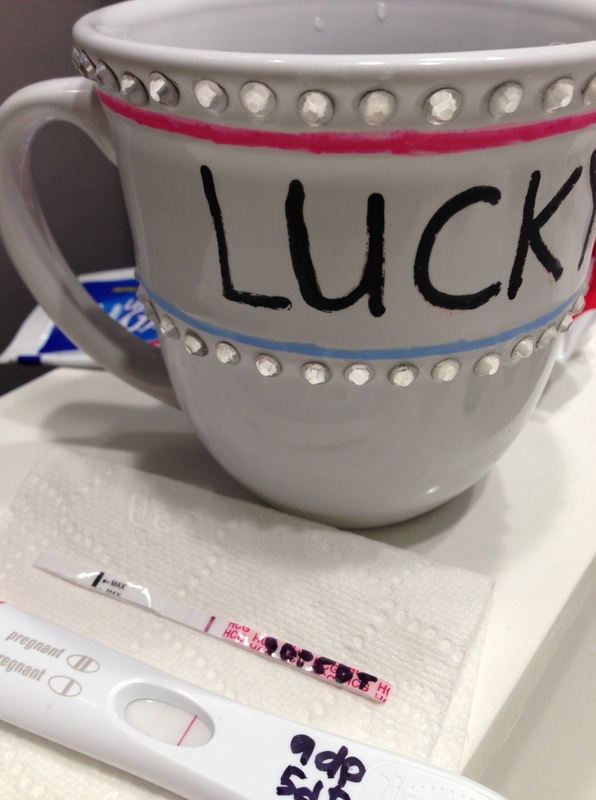 How would we make sure that we got to the IVF center on time? Do we call my brother to come pick me up while Bob waits for help? Do we hail a cab and abandon the car? My mind went wild. Luckily, we got to the IVF center safely without incidents. Bob was so proud that he got me there 10 minutes early. We got called back to the transfer room. At that point, we didn’t have news on how Clay thawed. I was quite confident that it probably did well but again, there was no way of knowing. I just knew that we had something to transfer. Just didn’t know how many embryos. I was told to undress from the waist down and wrap myself around with a warm blanket. I was surprised that no one asked us to change into anything else. I remember reading about other ladies’ experiences of their transfers and vaguely recalled that they had to change into something else. The nurse checked my bladder and said, Nope it’s too full; it’s making the uterus very tiny. So off I went to the bathroom to let out some pee. She told me to count at the beats of the Jeopardy song for 12 counts. I had to do this three times before they got a satisfactory amount of pee. 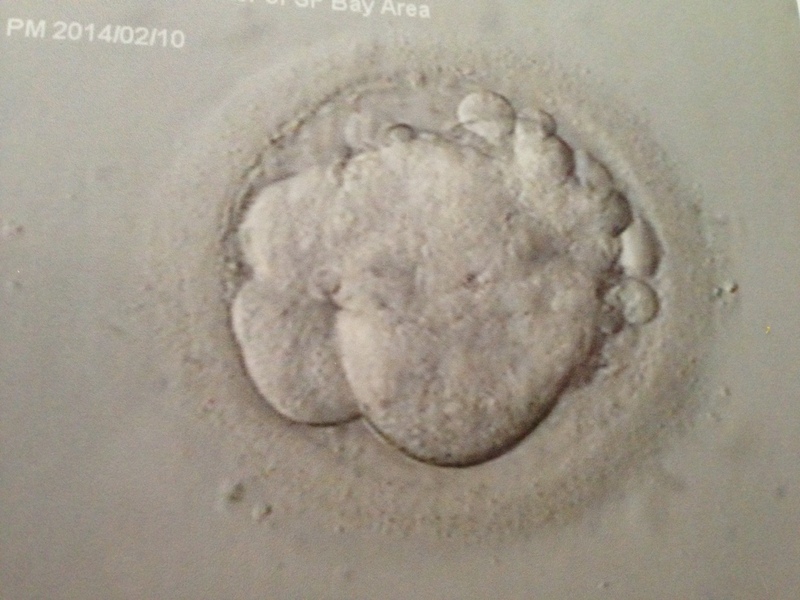 Then in came Dr. E with two photographs of the embryos. Clay thawed 100% beautifully without any fragmentations. 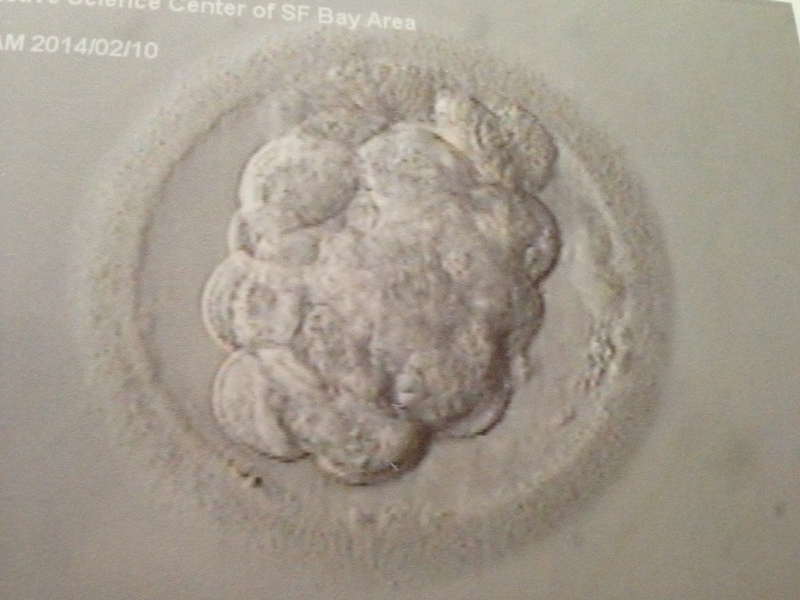 Eli was also without any fragmentations and accordingly to her, looked like it was on its way to be a blastocyst. Then it came the procedure. Must be the Valium talking because I was so talkative and speaking nonstop. It was a very cool procedure. And it was so much better that Bob was by my side. I recently read that the clinic that specializes in mini-IVF in SoCal doesn’t allow husbands to be in for the transfer… I’d be very disappointed if Bob wasn’t allowed to be there. I was introduced to a lab technician who emerged from a closed door. She asked me for my name and how many embryos I was transferring. After Dr. E placed the catheter inside me, the lab technician disappeared for one minute to retrieve the embryos. 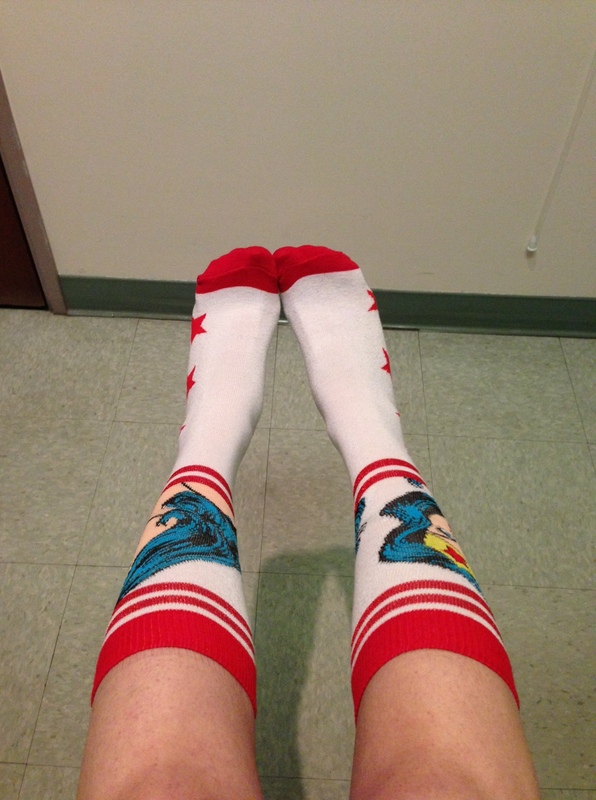 Dr. E said to Bob, “This is a good time to take a video.” Bob was like… “Uh? ?” I turned my head and said, “Hey let me do it! Give me my phone.” So I held my phone up to the screen closest to me and followed my doctor’s instruction to start pressing record when the door opened. The lab technician came back with the catheter with our embryos and we watched the catheter move into the uterus. It’s truly a very cool procedure. I remember watching Dr. E on TV on one of the local morning news station, talking about IVF, IUI, and assisted reproductive technology in general. That was when Bob and I were dating. When we pulled into the parking lot, Bob said, I can’t believe that we’re doing a transfer today after watching Dr. E on TV a few years ago. I lay there for a couple more minutes. Dr. E chatted with us and told us what to do next. I am to rest. Think lying on a beach on a beach chair. Bob is to wait on me and get me whatever I want and need. Whatever I need, if he can do it, he’ll do it. So other than peeing and showering, he is going to take care of me. I would say it sounds wonderful! Beta test is eight days from now. It seems like beta day varies greatly among REs. I’ve seen from 12 days to 17 days. I will have to schedule an appointment early in the morning before work. It feels good to be finally at this step. I know that it is no guarantee. But this definitely buys us a fighting chance of getting pregnant. If I don’t get pregnant, I still have the hope that we can make embryos and it can happen. It may just take a little while. We have had so many people praying for us and rooting for us that we’re feeling so so blessed. Praise the Lord that He has been watching us every single step of the way. I am going to enjoy the next eight days as this is the most “pregnant” I have gotten in my life. We are one step closer to our goal of having a take home baby by end of this year. I hope that this is God’s plan for us.